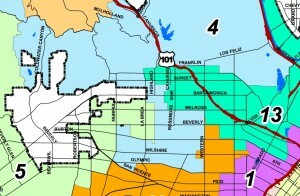 On August 9, District 4 Councilmember Tom LaBonge will lead a bike tour of Hollywood. Tom’s a strong supporter of bikes, so we’re looking forward to a fun ride! District 4 surrounds much of the north and east boundaries of West Hollywood, and this area has been long-neglected when it comes to bike infrastructure. With crumbling pavement, impassible roads, and a marked shortage of racks, it’s important for us to come out and demonstrate that change is needed. The ride will begin at Tom’s Hollywood Field Office at 6501 Fountain Avenue, and will run from 6pm to 8pm. All participants must sign wavers and be over 12. Route TDB.